Yes, we have covered the Wildcharger Pad and we have covered the Powermat, and I think it is about time for a Face/Off! It would appear that the Powermat is winning as far as basic space is concerned. 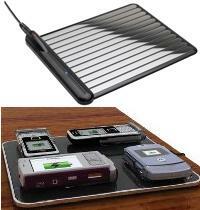 The Wildcharger Pad is an 8″ x 6″ space capable of holding 2 mobile devices, but the company says that it can hold five. That most be with the Wildcharge PowerDiscs. The Powermat can hold about three mobile gadgets. So I suppose the Wildcharger has the Powermat beat for the number of mobiles. In all honesty, I don’t know a time when I needed to recharge five mobiles at any given time. Now lets look at aesthetics. I like the Powermat’s look with its ebony black exterior, but the Wildcharger looks like a barbeque grill covered in aluminum foil. So far we’re tied. Let’s look at price. Powermat costs about $99, and the Wildcharger pad costs about $49 as is. However, that Powermat kit comes with a power cube and attachments, which you would have have to buy the peripherals for the Wildcharger pad anyway. I’m not certain if the prices would even out. So hey, I’m not going to say which one really “wins” this battle. After all, don’t we usually shun monopolies? Each product can do what it says, and that is what is most important. I saw the cube for the wildcharger priced around &70, so the price does even out. Great review – I;m trying to pick a Christmas present.